Your usual Technical Service Centre is qualified to answer questions related to myCWT. Please contact them in priority even if they are not listed below. When contacting the support teams, please do not forget to provide a few key details that will facilitate the support process and reduce the time to solve: Your Last and First name, your Company Name and a short description of your inquiry. The myCWT website has a technical assistance contact form available via a link at the footer of the website. When reporting an issue please make sure you provide as much details as possible to describe it (what was the error, when it occurred and exactly where at the page). This will speed up the investigation and help to solve your issue in a timely manner. The myCWT mobile app has a technical assistance contact form available via the main menu. 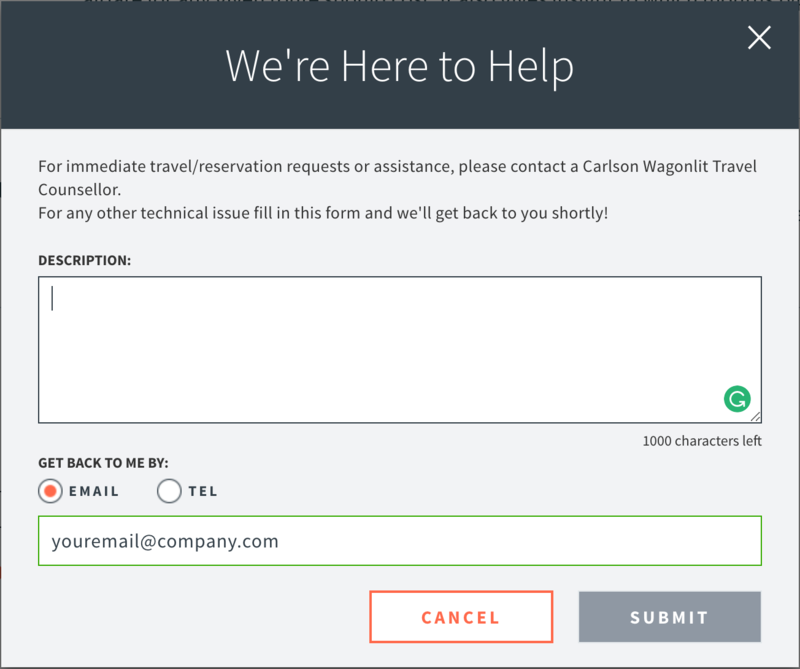 Once choosing the category, an email window will open up where you can send your assistance request. ** If you need an emergency assistance with travel related issues or booking, please see out list of 24-hours support centers.